JOB 22:21 KJV "Acquaint now thyself with him, and be at peace: thereby good shall come unto thee." 18Yet he filled their houses with good things: but the counsel of the wicked is far from me. 19The righteous see it, and are glad: and the innocent laugh them to scorn. 20Whereas our substance is not cut down, but the remnant of them the fire consumeth. 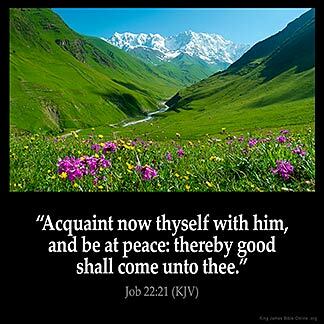 21Acquaint now thyself with him, and be at peace: thereby good shall come unto thee. 22Receive, I pray thee, the law from his mouth, and lay up his words in thine heart. 23If thou return to the Almighty, thou shalt be built up, thou shalt put away iniquity far from thy tabernacles. 24Then shalt thou lay up gold as dust, and the gold of Ophir as the stones of the brooks. Acquaint now thy selfe with him, and be at peace: thereby good shal come vnto thee. "Yield now and be at peace with Him; Thereby good will come to you. Put yourself now in a right relation with him and be at peace: so will you do well in your undertakings. Acquaint now thyself with him, and be at peace: by this good shall come to thee. Acquaint yourself with him, now, and be at peace. Thereby good shall come to you. Acquaint now thyself with Him, and be at peace; thereby shall thine increase be good. 22:21 Him - With God, renew thy acquaintance with God by prayer, and repentance for all thy sins, and true humiliation under his hand, and hearty compliance with all his commands, and diligent care to serve and enjoy him. It is our honour, that we are made capable of this acquaintance, our misery that by sin we have lost it; our privilege, that through Christ we may return to it; and our unspeakable advantage, to renew and cultivate it. And be at peace - At peace with God, and at peace with thyself, not fretful or uneasy. Good shall come unto thee - All the good thou canst desire, temporal, spiritual, eternal.